If you’re in London yourself, please read this: He listens to the name of Martin. He’s a very nice guy and can talk for hours about topics that interest him. He’s a slow eater (just like me). He misses his girlfriend, his friends and his family. He’s extremely loyal. Apparently the other day some kids shoot a paintball (paintball bullet?) and hit the window to his room. That shall not happen again! 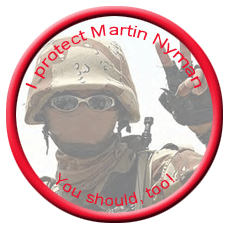 Therefore, I strongly encourage you to download this button image below, print it and put in your jacket. Robert, this idea is just great! I'm so glad I'm going to London in may for two weeks, so I can really wear this button. Haha, I wonder what the London people will think when they see the button (or maybe I'll even meet someone who wears it too). You'll probably be locked-up under "section 44" and the anti-terrorism law if you wear that badge in London. Suggestions: "He responds to the name of Martin", or is called, and "some kids shot a paintball pellet […] and hit his room window. He talks in that strange language but never mind you should tell him to visit the Kingdom of Yorkshire if he gets chance; Londoners aren't renowned for being that hospitable. Why the difference in the spelling of the last name? Nyman <abbr title="versus">vs.</abbr> Kniven? Great! I wish I were in London, just to wear this cool button! Thank you brotherman, for standing up for me! Do you think it's ok for me to wear the button as well, or will it only make me seem a bit psycho? I'll just tell the little bullies that my big brother will come and take care of them if there not nice to me. Thanks for the language pointers. Very good question. It's a result of my brother's twisted sense of humor; "kniven" means "the knife". I'll keep my eye out for him, where is he – North, South, West or East? Not sure exactly where he is, but I know the apartment is a little bit north of the Madame Tussaud's place.